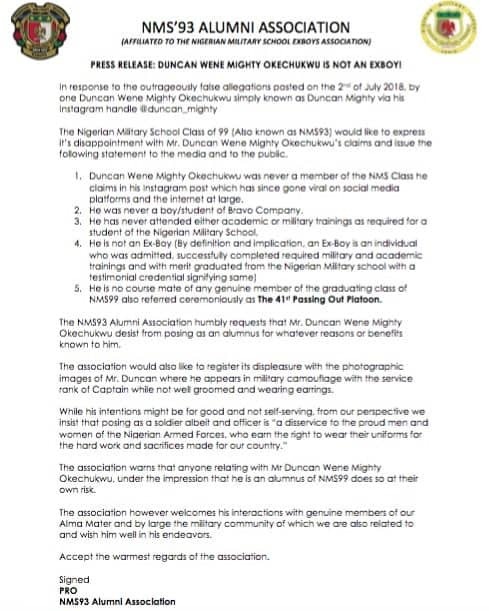 The Nigerian Military School Class of 99 (Also known as NMS93) would like to express it’s disappointment with Mr. Duncan Wene Mighty Okechukwu’s claims and issue the following statement to the media and to the public. 1. 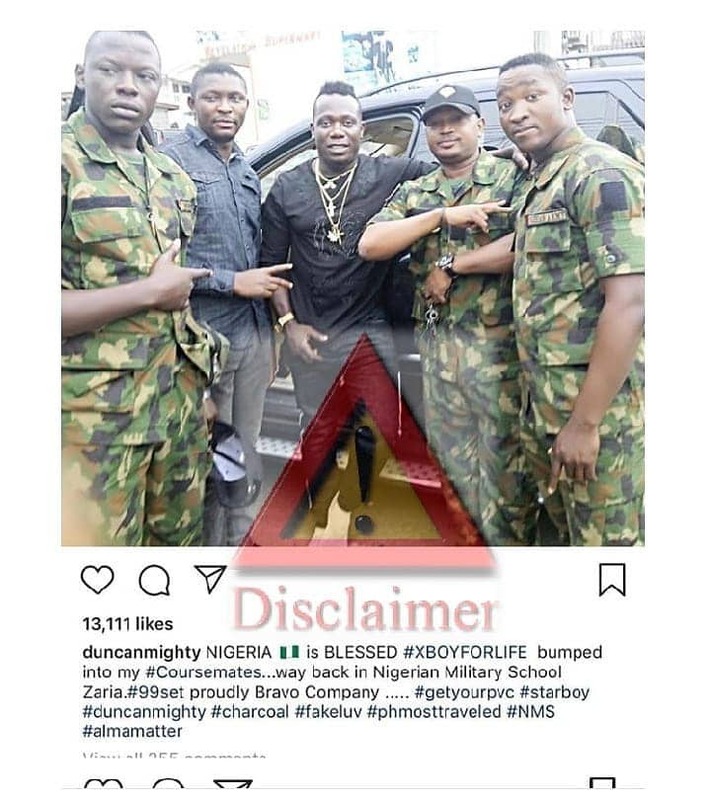 Duncan Wene Mighty Okechukwu was never a member of the NMS Class he claims in his Instagram post which has since gone viral on social media platforms and the internet at large. 2. He was never a boy/student of Bravo Company. 5. He is no course mate of any genuine member of the graduating class of NMS99 also referred ceremoniously as The 41st Passing Out Platoon. The NMS93 Alumni Association humbly requests that Mr. Duncan Wene Mighty Okechukwu desist from posing as an alumnus for whatever reasons or benefits known to him. 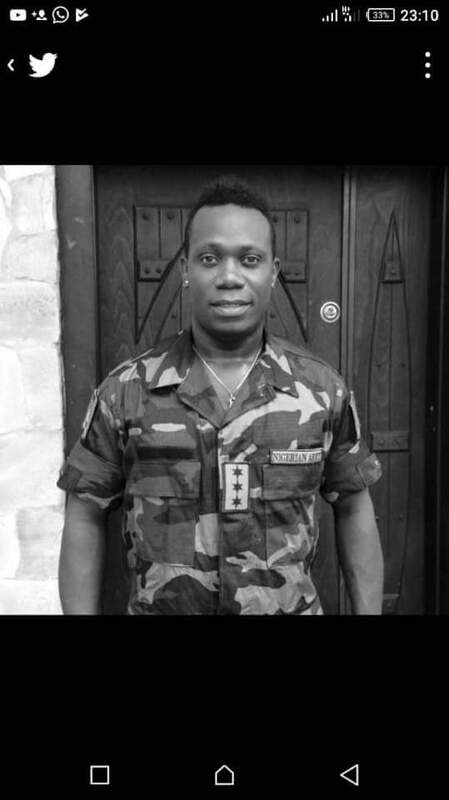 The association would also like to register its displeasure with the photographic images of Mr. Duncan where he appears in military camouflage with the service rank of Captain while not well groomed and wearing earrings. 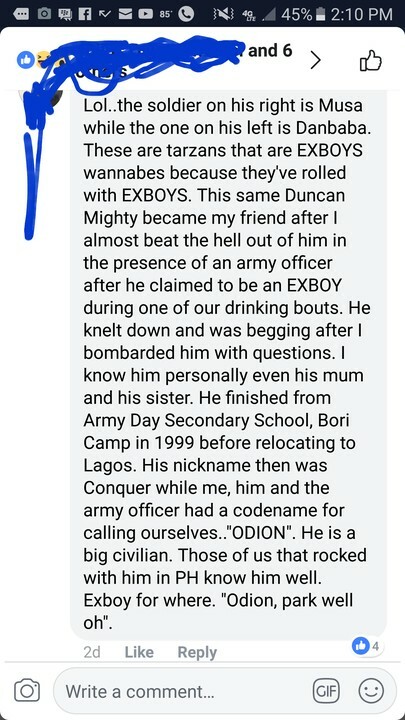 The association warns that anyone relating with Mr Duncan Wene Mighty Okechukwu, under the impression that he is an alumnus of NMS99 does so at their own risk. The association however welcomes his interactions with genuine members of our Alma Mater and by large the military community of which we are also related to and wish him well in his endeavors. Accept the warmest regards of the association. Posted by Mr. Cis on July 4, 2018.